For other uses, see Wallsend (disambiguation). Wallsend, historically Wallsend on Tyne, is a town in the metropolitan borough of North Tyneside, North East of England, in the traditional county of Northumberland. Wallsend derives its name as the location of the end of Hadrian's Wall. 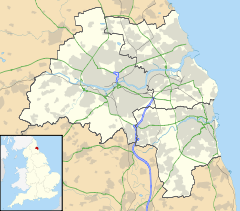 It has a population of 42,842 and lies 3.5 miles (5.6 kilometres) east of Newcastle City Centre. The population of the Wallsend ward of the North Tyneside Borough was at the 2011 census 10,304. In Roman times, Wallsend hosted the fort Segedunum. This fort protected the eastern end of Hadrian's Wall, which terminated at the western wall of the fort. The withdrawal of the Romans from the Wall immediately brought the Picts from the north and shortly after the Angles, sailing from near the mouth of the River Elbe with frequent raids coming both from sea and land. Ida the Saxon laid waste to the whole of the north in 547 and Wallsend doubtless suffered in the general devastation. It was not until the golden age of Northumberland under Edwin of Northumbria, and the subsequent introduction of the Christian faith by King Oswald of Northumbria (635-642) and St Aidan, that Wallsend enjoyed a time of peace and progress. This time of peace came to an abrupt end in 794 when the Danes (or Vikings) swarmed up the Tyne in great number. The years preceding the coming of William of Normandy were a struggle between Danes and Saxons striving for mastery. Several urban sanitary districts were formed in the parish in the late 19th century: Willington Quay, Howdon and Wallsend itself. The first two joined to form the Willington Quay urban district under the Local Government Act 1894, with the portion of the parish outside any urban sanitary district forming the parish of Willington in Tynemouth Rural District. Wallsend became incorporated as a municipal borough in 1901, and in 1910 took over Willington Quay and Willington, and also part of the parish of Longbenton. The Church of England (St Peter's) has four fine stained glass windows by Michael Healy (artist) of An Túr Gloine: St Patrick, St Peter and St Luke (1913); Our Lord with the Nativity and the Shepherds (1919); Angel of the Resurrection with St George and St Christopher (1921); Our Lord walking on water (1921); and a window by Ethel Rhind, also of An Túr Gloine, depicting The Good Shepherd, Mary of Bethany, David (1921). World Unicorn being built by Swan Hunter at the Wallsend shipyard, Tyneside in 1973. Wallsend has a history of shipbuilding and was the home of the Wigham Richardson shipyard, which later amalgamated to form Swan Hunter & Wigham Richardson, probably best known for building the RMS Mauretania. This express liner held the Blue Riband, for the fastest crossing of the Atlantic, for 22 years. Other famous ships included the RMS Carpathia which rescued the survivors from the Titanic in 1912, and the icebreaker Krasin (launched as Sviatogor) which rescued the Umberto Nobile expedition on Spitzbergen in 1928, when Roald Amundsen perished. The story is retold in the movie The Red Tent, starring Sean Connery and Peter Finch. Charles Parsons launched his revolutionary Turbinia here in 1894, thus not only revolutionising the navies of the world, but also, through the large-scale production of affordable electricity, making a significant contribution to the modern age. He features in a BBC film called The Inventor of the Twentieth Century. Russian novelist Yevgeny Zamyatin worked at Swan Hunter in 1916–17, and used it as background for his great anti-utopian work We which was a major influence on George Orwell's Nineteen Eighty-Four. WWII ships built here include HMS Sheffield and HMS Victorious which took part in the sinking of the Bismarck. Other ships built there include the new HMS Ark Royal in the 1980s. The shipyard closed in 2007. The musical The Last Ship by Sting is set in the shipyard. The former Wallsend Slipway & Engineering Company Shipyard continues to operate, constructing offshore oil rigs and as a TV studio, productions from there include the hit ITV drama Vera starring Brenda Blethyn and Inspector George Gently starring Martin Shaw. Much of Wallsend's early industry was driven by coal mining. The Wallsend Colliery consisted of seven pits which were active between 1778 and 1935. In the 1820s the pits became incorporated as Russell's Colliery, which then became The Wallsend and Hebburn Coal Company Ltd. By 1924 the colliery employed 2,183 people. Its most prominent manager was mining and railway engineer John Buddle who helped develop the Davy Lamp. Between 1767 and 1925 there were 11 major incidents recorded at the colliery resulting in over 209 deaths. On 18 June 1835 a gas explosion in one of the tunnels killed 102 miners, the youngest of which was aged eight and the oldest 75. Many of the dead were found with their cloth caps in their mouth. This is believed to have been an attempt to prevent inhalation of the gas which eventually killed them. The bodies were extracted and buried in St Peters churchyard at the top of the bank overlooking the Wallsend Burn. A plaque has been erected within the churchyard to commemorate this tragedy. The town has expanded greatly in terms of housing since the end of World War II, and since the 1960s. Wallsend Town Centre—including the main shopping area known as the "Wallsend Forum"—is in fact to the west of the land covered by the town. To the north of this area lies the older estate of High Farm and the new estate of Hadrian Lodge. The town centre of Wallsend is separated from the eastern areas of the town by the Wallsend Burn, a stream running through a small glacial valley from north-west to south-east and through the Willington Gut into the River Tyne. To the east of the Burn is the old area of Holy Cross, which contains the ruins of a medieval church, the pre-war estate of Rosehill and the mainly post-war estate of Howdon. To the south of Howdon lies Willington Quay which, as its name suggests, once served shipping but which is now dominated by industry and housing. East Howdon forms a small enclave between Willington Quay and North Shields. The town's principal thoroughfare and shopping street is the High Street. To the north of this street is Wallsend Green, the town's most picturesque area, consisting of large houses surrounding a green square. Behind the Green, where the Burn runs through the parkland of the Hall Grounds lies Wallsend Park, a traditional British municipal park, whose restoration has frequently been demanded by local residents and is planned with many improvements such as a skate and BMX park, better pathways, and a rebuilding of the Duffy Memorial Fountain. On Rheydt Avenue in Wallsend is Centurion Park Golf Club, previously named Wallsend Golf Club. It has 18 holes and a driving range. The town is home to Wallsend Boys Club, an association football club, which has produced many famous players such as Alan Shearer, Lee Clark, Steve Watson, Peter Beardsley, Robbie Elliott, Mick Tait and Michael Carrick. It is also hometown and birthplace to internationally successful musician Sting, whose song All This Time refers to the Roman wall and fort. The musical The Last Ship, composed and written by Sting, is set in Wallsend. In dedication to its Roman heritage, Wallsend's historic name Segedunum is shown in many places in the town, and signs with Latin wordings can also be found. Wallsend Metro Station has some signs in English and Latin. Such translations tend to amuse, with contrasts between today's and ancient times. Segedunum Roman Fort Museum has displays on Roman history as well as reconstructions of a bath house and a section of the Roman Wall which once stood on the site. In 2011 Wallsend had a population of 43,826 compared with 42,842 in the previous census. In Wallsend, 4.9% of the population is non-white British, which is the same as the surrounding borough. It also has the same percentage of Asian people, but has slightly more black people. Wallsend is the second least ethnically diverse major urban subdivision in Tyneside and has a larger percentage of white British people compared with Tynemouth which is also slightly larger in population. However it has more ethnic minorities than Jarrow, which is south of the river Tyne. ^ "Ward of North Tyneside Borough population 2011". Retrieved 4 July 2015. ^ Richardson, William (1923). The History of the Parish of Wallsend. City of Newcastle Upon Tyne Education and Libraries Directorate. ISBN 1-85795-034-8. ^ "World War One role of luxury liner RMS Mauretania". 13 November 2014. Retrieved 7 February 2017 – via www.bbc.co.uk. ^ "The Carpathia". Archived from the original on 8 May 2012. ^ "Objects". Retrieved 7 February 2017. ^ "HMS Ark Royal to be scrapped in Turkey". Retrieved 7 February 2017. ^ "History of Wallsend". Archived from the original on 11 June 2013. ^ a b "History of Wallsend Parks - North Tyneside Council". Retrieved 7 February 2017. ^ a b Museum, Durham Mining. "Durham Mining Museum - Wallsend Colliery". Retrieved 7 February 2017. ^ "John Buddle - Graces Guide". Retrieved 7 February 2017. ^ "Behind the controversy: John Buddle and the development of the safety lamp". 4 March 2015. Archived from the original on 2 April 2015. ^ "About Segedunum". Archived from the original on 14 October 2012. ^ "KS201EW (Ethnic group) - Nomis - Official Labour Market Statistics". Retrieved 7 February 2017. ^ Services, Good Stuff IT. "North Tyneside - UK Census Data 2011". Retrieved 7 February 2017. ^ Broadbent, Mercedes (31 January 2014). "10 stars you might not have known were from the North East". Retrieved 7 February 2017. ^ "Paul Kennedy - Department of History". Retrieved 7 February 2017. ^ Chronicle, Evening (23 September 2009). "Display shows T Dan Smith altered Newcastle". Retrieved 7 February 2017. ^ "Gaddes, Richard (born 1942), opera administrator : Grove Music Online - oi". doi:10.1093/gmo/9781561592630.article.a2235173. Retrieved 7 February 2017. ^ Proctor, Kate (6 March 2015). "Sting talks to fans about 'paying back his debt' to his Wallsend community". Retrieved 7 February 2017. Wikimedia Commons has media related to Wallsend. Wikisource has the text of the 1911 Encyclopædia Britannica article Wallsend. Iconic images of Wallsend, Tanker "Tyne Pride" overlooking terraced houses. This page was last edited on 21 April 2019, at 15:54 (UTC).